This month we’re being asked to explore the idea of blessings in disguise. These disguises often appear painful, uncomfortable or totally different than what we expected or even wanted. When these “disguises” happen we tend to be blinded for a bit as to the blessings they offer. At first we’re just trying to make sense of it while also trying to figure out what to do next. It may be years before the blessings are fully realized. Recently, someone close to me said something to me that was quite hurtful. He later apologized however the words still hung there like laundry put out to dry. As the sting of it wore off and I examined it more closely, I started to see it from a different perspective and discovered something about myself that lay hidden from me for many years. I feel like I have a better understanding of why I have a tendency to sabotage myself. With that newfound awareness, I can start doing something about it. And now I see what a blessing those painful words were for me. We all know of stories where people miss a flight only to find out later that the flight was cancelled or had problems with it. Or a star athlete becomes injured early in his/her career and turns out to be the best coach ever. Or someone loses their job only to turn around to have more success starting their own business. Sometimes I feel like these “disguises” are really just course corrections on our lifelong journey…guiding us and leading us to the life we really want to live. When we become so singularly focused on one thing we can sometimes fail to see other bigger and/or better possibilities. So yeah, at first the “disguise” may seem like a major setback in our lives however if we take a look around, see things from a different perspective, we can begin to see their blessings. What blessings in disguise have you experience lately? 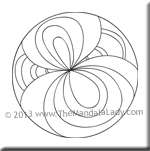 Ponder this as you color this month’s mandala of the month. Be sure to download Section 7 of the 2013 Mandala of the Year.